Whenever I give a talk about global warming, the question asked most often is, "Isn't the population explosion the root cause of our problems?" The answer is, "Partially." Carbon dioxide emissions, which are the main cause of global warming, depend on the number of people emitting CO2 times the CO2 emission per person. The problem can be solved by reducing the number of people, or by reducing the emissions per person (mitigation: by people conserving (using less energy), using energy more efficiently, or moving to renewable energy technology, such as wind and solar that do not emit CO2). Carbon geoengineering (CDR - carbon dioxide reduction) is too expensive and would only slowly reduce global warming (1). Solar geoengineering (SRM - solar radiation management) (2), by continuous production of a stratospheric cloud or by brightening clouds over the ocean to reflect sunlight would produce so many dangerous side effects that the world could never come to an agreement on how to implement it (3). The technology to do geoengineering does not even exist, and there are serious doubts if it is even possible to create a thick enough stratospheric cloud (4). The 21st Conference of the Parties to the Framework Convention on Climate Change will meet in Paris in December 2015, and may take small moves toward mitigation, but so far there have been no global meaningful moves to reduce CO2 emissions, or even the rate of increase of CO2 in the atmosphere. Therefore, in the spirit of Jonathan Swift (5), I have concluded that the only solution to global warming is population reduction. The most efficient method of quickly reducing the global population, and solving the global warming problem, is by nuclear war. A nuclear war between the United States and Russia today, with their nuclear arsenals targeted at cities and industrial areas, would produce tremendous amounts of smoke, blocking out the Sun and making it cold, dark, and dry at the surface (6). This nuclear winter (7), with summer temperatures below freezing, would wipe out global agriculture, sentencing most people on Earth to death by famine. The current nuclear arsenal, or even the reduced one after full implementation of the New START treaty in 2018, can still produce a full nuclear winter (7). The plan suggested here must be implemented before nuclear weapons are banned or the U.S and Russia reduce their nuclear forces to a couple hundred weapons, the same size that France, China, and the U.K. have determined is sufficient. Not only would the smoke from the fires cool the planet, but emissions of CO2 and other greenhouse gases would grind to a halt. Even with the modest temporary emission of CO2 from the fires, the global CO2 concentration would peak at only a little about the current 400 parts per million and would gradually go down, keeping global warming from coming close to the dangerous level of 2°C above the levels of the early 19th century before industrialization began, preventing dangerous anthropogenic interference with the climate system. 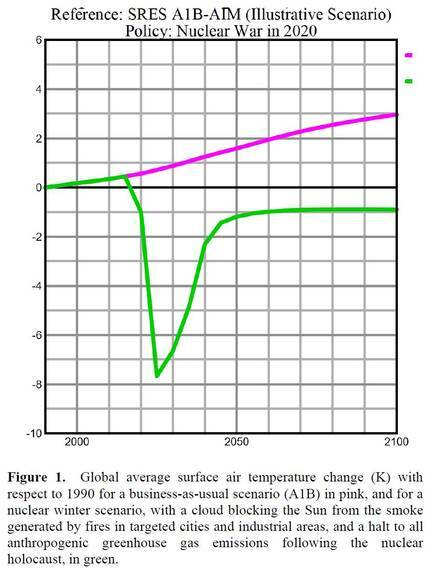 Figure 1 shows the global average temperature change for a business as usual global warming scenario and for a nuclear winter one. 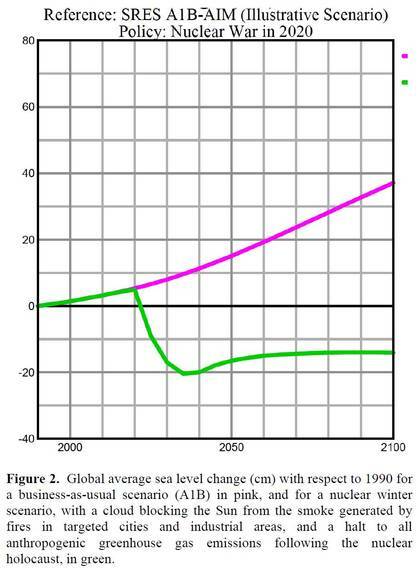 Figure 2 shows the resulting sea level changes. Problem solved. Methods. Simulations for Figs. 1 and 2 were carried out with MAGICC version 5.3, developed by Tom Wigley and Sarah Raper (e.g., 8). 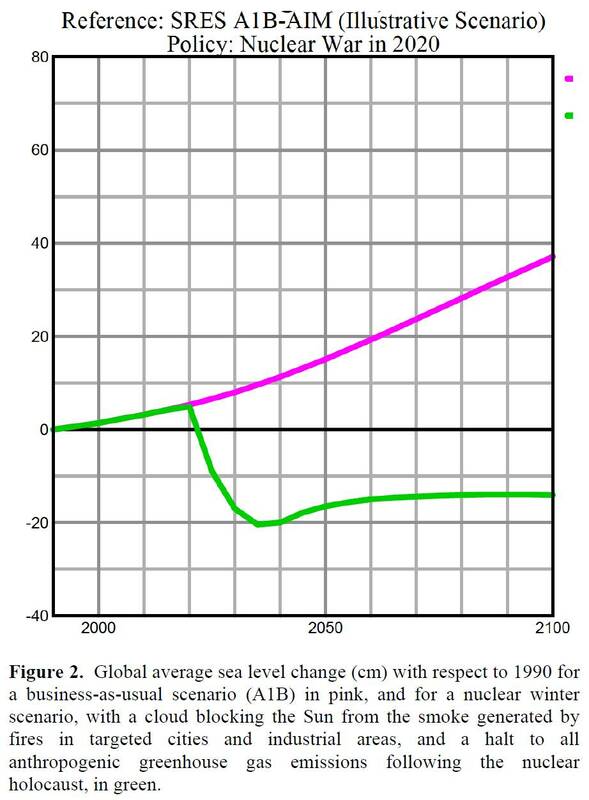 It is a sophisticated upwelling-diffusion energy balance model that has been used for analyses in previous Intergovernmental Panel on Climate Change reports. 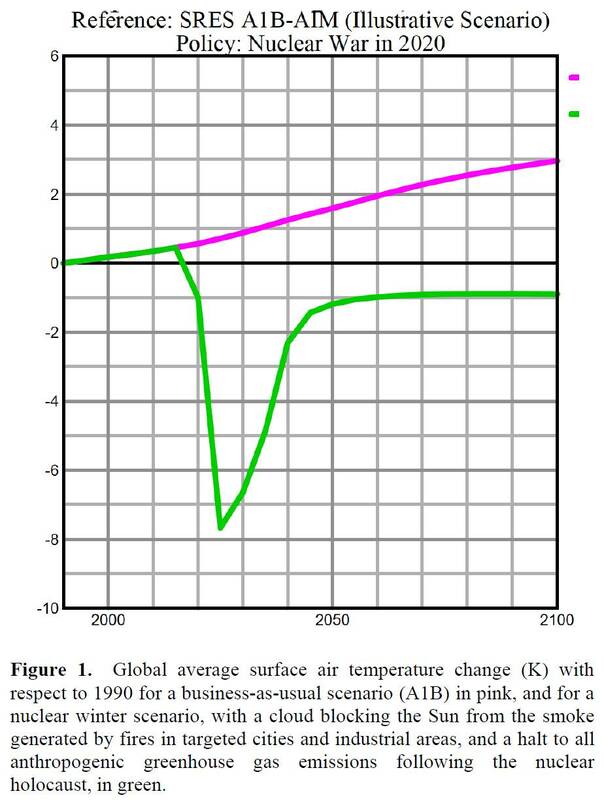 All model values were kept at default, including global average climate sensitivity set to 3°C warming for a doubling of CO2. Because MAGICC does not explicitly model soot, values of SO2 emissions were used to emulate the reduction of sunlight to match previous general circulation model simulations of nuclear winter (9). 1. Committee on Geoengineering Climate: Technical Evaluation and Discussion of Impacts, M. K. McNutt (Chair), Climate Intervention: Carbon Dioxide Removal and Reliable Sequestration, (U.S. Nat. Academy of Sciences, Washington, DC, 2015). 2. Committee on Geoengineering Climate: Technical Evaluation and Discussion of Impacts, M. K. McNutt (Chair), Climate Intervention: Reflecting Sunlight to Cool Earth, (U.S. Nat. Academy of Sciences, Washington, DC, 2015). 3. A. Robock, Ethics, Policy & Environment 15, 202 (2012). 4. U. Niemeier, C. Timmreck, Atmos. Chem. Phys. 15 9129-9141, doi:10.5194/acp-15-9129-2015 (2015). 5. J. Swift, A Modest Proposal for Preventing the Children of Poor People From Being a Burthen to Their Parents or Country, and for Making Them Beneficial to the Publick, (S. Harding, Dublin, 1729). 6. O. B. Toon, A. Robock, R. P. Turco, C. Bardeen, L. Oman, G. L. Stenchikov, Science 315, 1224 (2007). 7. O. B. Toon, A. Robock, R. P. Turco, Physics Today 61(12), 37 (2008). 8. T. M. L. Wigley, S. C. B. Raper, Science 293, 451 (2001). 9. A. Robock, L. Oman, G. L. Stenchikov, J. Geophys. Res. 112, D13107, doi:2006JD008235 (2007).